We rather like fairies in the Rollercoaster household (well the majority female contingent at any rate), and generally prefer them to those pesky Princesses (pah!) The girls and I recently went to see the lovely fairy doors at Furzey Gardens and they know their Tooth Fairies names, so when we were offered the chance to review the Flutterbye Fairy - a real flying fairy - I leapt at the chance despite not normally being a fan of those electronic type toys. She arrived beautifully wrapped in pink tissue with sparkling fairy dust sprinkled over the top. We excitedly got her out of her very lovely (although possibly slightly overpackaged) box. She then had to be charged for a while before we could use her - she does take rather a lot of batteries (6 x AA) but so far these have lasted well. The instructions seemed pretty simple once you found the switch on the fairy. She comes with a pink charging base which looks a bit like a jewellery box and you have to charge her from this before she can fly. A flashing light tells you when she is charged and then you simply disconnect the wire and press the button on the base to launch her. This however was when it went a bit wrong. She is meant to hover over your hand but really all she did was shoot up to the ceiling and crash into things. Admittedly she did fly by herself to do this and the girls found it hilarious at first but the magic soon palled. Little Miss just got bored but Bigger Miss did persevere. Two good points in her favour are that she did not seem to get damaged by all the crashes and she held her charge for a fairly good time before we needed to recharge her. I contacted Spinmaster and they said she might just be a 'naughty fairy' and kindly sent us a replacement. The new fairy had clearer instructions. including the valuable tip that if the fairy rises too fast or gets stuck on the ceiling you can press the button the base to slow her down (or get her down!) 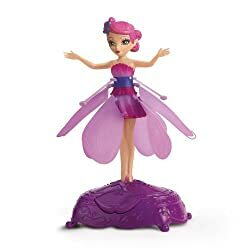 This fairy does definitely work better than the first one but she does still have a tendency to fly off and crash into things and we have not really been able to get her to hover over our hands. Now whether this is fairy handling errors on our part or not I couldn't be sure. Having seen some other reviews some people seem to get the hang of the fairies quite easily (or maybe they have lower expectations of the toy's abi. It could also be that we live in a very small house only 1 room wide and I think she would crash less and be easier to control in a bigger space (not outside though please - she might fly away forever). The Flutterby Fairy flying - and an example of what we have not really managed to do! Little Miss (age nearly 6 ) is not terribly interested as she cannot control the fairy but Bigger Miss (age 8) is still pretty keen and periodically gets her out to have another go - albeit none of them massively successful. The fairy is well made and really quite pretty for a plastic doll and she has survived her many crashes intact. Would I recommend it as a toy? Well I think that I personally wouldn't pay the RRP of £34.99 (even if you had a very well behaved fairy) but I might at a lower price. The recommended age is 6+ and I don't think girls under that would have the patience with it. I also wouldn't recommend it to people with small houses as I do think that that may be a factor with ours. Having said that it is attractive and well made - just a shame that it doesn't really work as the hype would have you believe but isn't that the way with a lot of toys? Bigger Miss still enjoys it and I guess the main point of a toy is to enjoy it? If you would like a Flutterbye Fairy then you can get them from places like Argos, Amazon and Toys r Us. Disclosure - I was sent a Flutterbye Fairy for the purposes of review but all words and opinions are my own. Great ideas for Christmas for kids! I love everything here. Thanks for sharing your knowledge about this. You know Christmas is fast approaching so I would like to try some of your ideas.